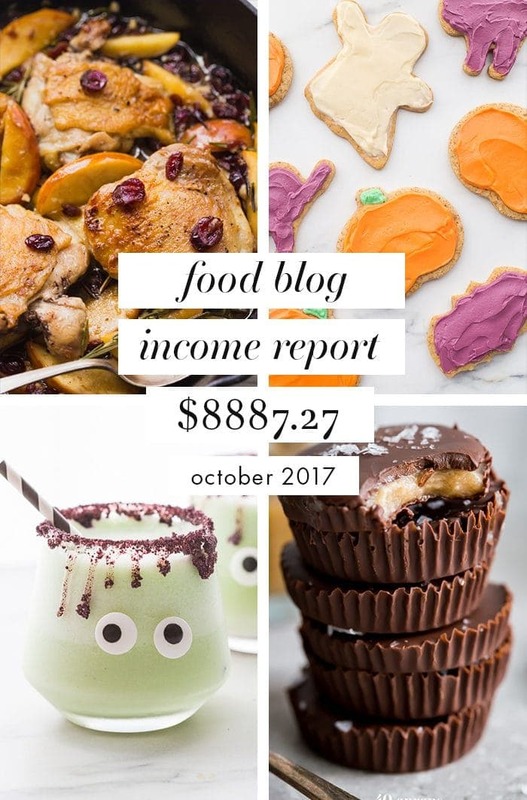 This is our food blog income report for October 2017. This food blog income report shows you how much traffic we had, what money we made, where it came from, and what it cost to run our site. This food blog income report is awesome for food bloggers looking to expand and monetize their blogs! I’ve been wanting to start sharing food blog income reports on my blog for a while now, because nothing has been more helpful to me as a food blogger than seeing what the possibilities are and how others are making it work for them. They sound great in theory, helpful for organizing our financials, and for encouraging food bloggers to learn more and share more. But when it comes down to it, it’s kind of terrifying: putting it all out there! I think most the time, people think I don’t have a “real” job, or that I sit around all day eating the food I make and slapping it up on the internet. Fifteen minutes tops, y’all. But, of course, that’s not quite how it goes. I’m lucky that food blogging has truly become a full-time job for me, supporting our little family with a career I can do flexibly and from home. So I’m starting a food blog income report series where I show you what we made, where it came from, what we spent, and what our traffic looked like that month. Hopefully it’ll help other food bloggers grow their own presences! Speaking of: it took me years to get here. Years and years (eight, to be exact) of posting content for the love of it, and only a couple making any money at all. And it’s been since, really, a year ago that I’ve made significant money, enough to scale back my previous full-time freelance business and, then, my full-time job at an ad agency. I spent years forwarding other bloggers’ income reports to my husband, asking him to strategize with me to help 40 Aprons get to the point where I could take it “full time.” And we’re finally here, and for that, thank you to all of my readers. I am so grateful for each and every one of you. Now that the sap’s out of the way, let’s get number nerdy, shall we? My traffic grew a nice, solid amount in October 2017, so I’m happy with that. I’m focusing on posting family-friendly paleo holiday recipes in order to combat a seasonal slump “health food” bloggers often see. We’ll see how that goes! I don’t include any of my freelance work that isn’t completely related to my blog and my online presence. For example, this month I did a photo shoot for a client who found me on Instagram. Directly related, so it goes in the report. I also did a website for a brand, but it’s not likely they hired me entirely because of my recipes, so… it stays out of the report. Sponsored posts: $2600. I had two awesome sponsored campaigns this month, so this number is a bit higher than it is normally. Ad revenue: I switched early in the month from Mediavine to Adthrive. I’ll talk a little bit more about that after the accounting. I’m beyond impressed with what’s happened since! Sales: $326.74. This number includes all the items I have for sale on my site, like my food photography presets, my ebook Improve Your Food Photography Almost Instantly, and my Total Whole30 Guide ebook and meal plans. Amazon Affiliate sales: $232.79. This is what I make when anyone purchases something using a link from my site. It doesn’t cost the buyer anything else, but gives me a small portion of the sale as a referral fee for the purchase. I’d really like this number to be higher. WPOpt: $42.99. I adore my host, and they keep my site running super fast. They even include an https certificate, so I didn’t have to deal with any headache at all. They offer different levels for different traffic volumes, so there’s something for everyone. I probably need to upgrade soon, but I still feel like WPOpt handles the volume well at the level I pay for. I highly recommend them. Mailerlite: $65. My list is so important to my traffic, but that focus has made it pretty large. I use Mailerlite because it’s super affordable and offers tons of features that are important to me as a blogger. Do you know how much it would cost me to send emails to my list on Mailchimp? $150 a month! Holy moly. I highly recommend Mailerlite; their customer service is fab, too. Food blogger VA: $600. My assistant helps me with finding social media links to share, on photo and video shoots, and on a million other things. She’s taking on new clients right now, too, if you’re interested! She’s awesome; check her out. Holy mama. This time last year I was making $400 a month on my blog and feeling like I was killlllllin’ it. And I was! But since then, I transferred away from Google Adsense (Dreadful) to Mediavine and then to AdThrive. But what really caused the increase? This cannot be overstated. I found my people! I found my niche, the little portion of the internet that likes what I have to say. I did my first Whole30 a little over a year ago and found it to be life-changing, so I started posting more and more Whole30 recipes. Turns out, a few people out there like the sort of Whole30 recipes we make, and so my audience has grown organically over the last year. Extremely important as well: I built my list with a high-quality lead magnet. I always give away something to convince people to sign up for my email newsletter, and I try to make sure it’s really worth it. My list is larger than a lot of other bloggers at the same level of traffic, I believe because of the giveaways I do to convert visitors to my list. My list is crucial for me, and I obsess over it and how I can continue to offer helpful and high-quality material to visitors. Why did I switch from Mediavine to Adthrive? Mediavine was phenomenal for 40 Aprons; they were the first well-paying ad network I’d ever been on, and their service is the best I’ve ever experience. But I started noticing other bloggers, thanks to their income reports, using Adthrive and seeing higher RPMs. I reached out and chatted with them, and their numbers were fantastic. They basically guaranteed me an increase in my RPMs (Revenue per mille. Translation: how much money you make per thousand views), and I was excited to see what would happen. They transitioned me over by hand; I did nothing. From there, they worked on my site for a few weeks before letting me see what I was making. The idea is that they want to move ads and configurations around to maximize the revenue for your specific site; it’s very customized to you. And because it’s custom to you, the RPM every blogger reports is different, too, so keep that in mind! Nothing is the same across the board. However… when I finally logged in after a few weeks, I was blown away. At the rate I was earning with Adthrive, I would have earned $1600 more than the exact same month with Mediavine. For doing nothing different. In fact, Adthrive actually runs fewer ads. Isn’t that amazing? And this month (November) I’m slated to make my all-time highest ad revenue, thanks to some amazing RPMs and solid, but not exceptional, traffic. I’ve been beyond impressed with Adthrive since making my switch, if you can’t tell, and they’re so helpful and informative there, too. I highly recommend checking out Adthrive. You have to have a minimum of 100,000 pageviews per month to join, but if you meet that criteria, you should definitely look into their network. They’ve been beyond amazing for our family. If you’re a food blogger, did this food blog income report help you? What would you like to see in the next food blog income report? Thanks so much for sharing. I’m trying to relaunch a blog that I abandoned before I gave it a chance to even really grow. This was helpful. Thanks so much for this! I have just started my allergy friendly Paleo blog and I have been having massive issues with MailChimp and I have tried everything to fix it with no avail. I was asking myself “why is this happening?”, “what is life trying to tell me?” and then I saw this blog post. Ah-ha! Sometimes when a door won’t open is because it wasn’t meant for you and this is proof. I had no idea there was such a huge difference in price, I wasn’t thinking into the future so thanks very much for this article!! Hey Cheryl, it’s awesome to see you crushing it with your food blog! 🙌 Thanks for taking the time to share these insights with your followers. This type of breakdown is priceless for people starting out in this space. We’re excited to see that we’re able to help in our own small way, and can’t wait to see where you are this time next year! Keep sharing those beautiful photos, and keep up the awesome hard work! Wow! Good for you. Thanks for sharing. It does help as most of the time I have no idea what to do to monetize my blog. I just started getting laser-focused in the last month- after a few years of not really sure what I wanted to do. I don’t do food, but the idea is the same. When you shared this, it gave me something I could sink my teeth into. I’m SO glad it was helpful for you! I remember poring over other bloggers’ income reports in the past, trying to use it to strategize for my own self. So much of what we do feels vague or unchartered, so having concrete details always helped me. If you ever need help with your blog, please let me know! I’m so glad it was inspiring for you! And thank you so much for your kind words 🙂 Your photography is so lovely! This was soooo cool to read! I have a bakery / sweet treats blog that I’m trying to be better at and find my niche but your blog post was really helpful to me!! I found your website when I was doing my first Whole 30 before my wedding and since then have been getting your emails and I LOVE every email you send – even though I won’t make your recipes right away, I definitely pin them for later!! I’d love to learn more on food photography “set-up” if you don’t have a ton of natural light in your home? Thanks in advance!! I’m so glad it was helpful for you! And a photography setup in a low-light situation is a fantastic idea. I plan to write about that soon! Thanks so much Elizabeth 🙂 And if you ever need any help with finding your niche, let me know! Thanks for sharing this information! As a former blogger and current social media/online communication professor, this kind of information helps me to provide the best education to my students. Congrats on a stellar month! Thank you so much for sharing! First, I love seeing other people succeed. GOOD FOR YOU! Second, I love being able to see other people’s metrics. I loooooove numbers. Third, it is cool that I see you around the internets (groups, etc) and I know you are doing good stuff! Finally, stuff like this is inspiring and gives a guy like me in my beginning months something to reach for! So, thanks again! Hey Ben! I’m so glad you found this helpful 🙂 I’m a numbers lover, too! The analytics are almost a problem for me… I get too deep sometimes! So glad my willingness to overshare can help inspire you in the early days, too!